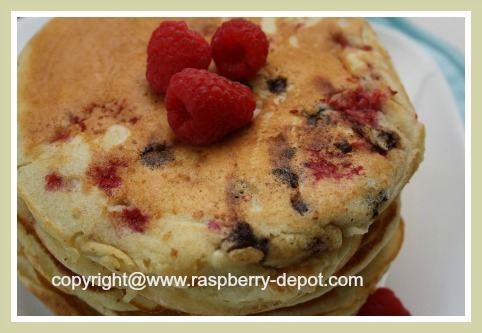 This Raspberry Chocolate Pancakes Recipe screams "easy!" These pancakes are out of this world for kids, and those who are kids at heart! Whether you are looking for Pancakes to make for kids on Pancake Day, or ANY day - you have found an easy recipe here! 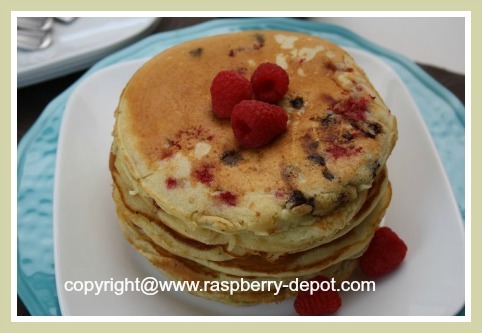 When it come to pancakes, one of my favourite combinations is "chocolate and raspberries", and this recipe brings them together in truly scrumptious pancakes that are really the easiest pancakes to make -- using a store-purchased pancake! You can use fresh OR frozen berries for this recipe, and, of course, if you prefer or have on hand blackberries, or blueberries, or sliced strawberries - they can easily be substituted for the raspberries! Prepare the pancake mix as directed on the packaging label. Stir in the desired amount of chocolate chips. Gently stir in the raspberries, being careful not to crush them too much. Spoon 1/4 cup of batter onto a preheated, greased griddle. Cook until bubbles appear on the surface and turn. 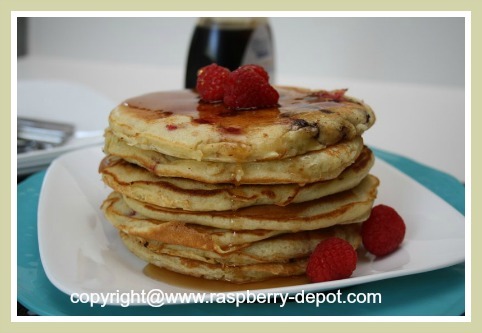 Serve with warm maple syrup or raspberry sauce. Make a double (or triple) batch of pancake batter, fry them all, and store left-over pancakes in the refrigerator for up to one week. Then, when you are ready to enjoy a pancake breakfast or brunch, simply re-heat the ready-made pancakes in the microwave ... they will taste almost as good as fresh-made pancakes!